Preregistered riders signed up by March 1st at Midnight are guaranteed a complimentary event t-shirt. Shirts are available after this date on a first-come, first-serve basis for $10 online. We cannot guarantee shirts to late or walk-up registrations. 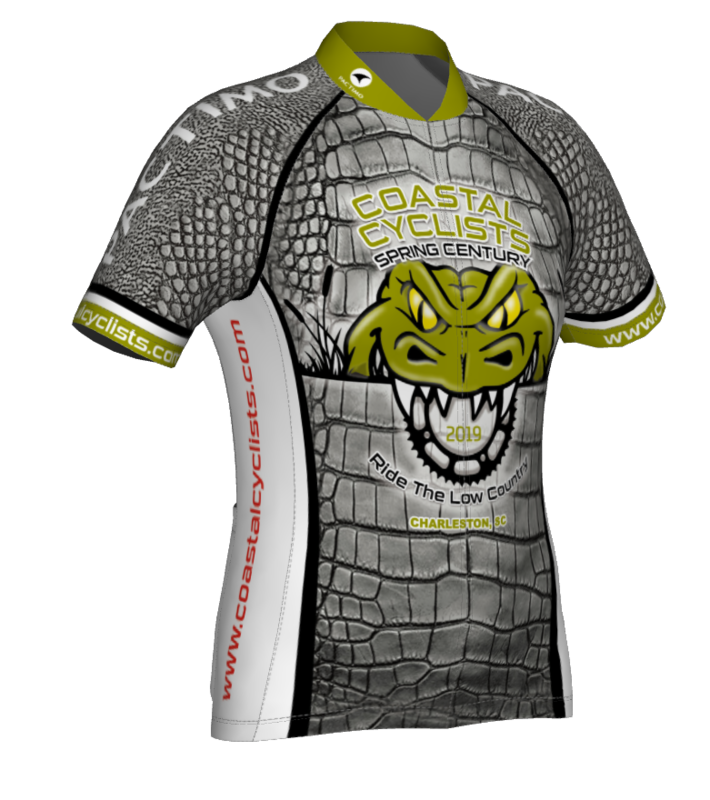 We are excited to offer a custom designed, ride jersey in both a men's and women's fitted style by Pactimo. Jerseys can be purchased online when you register for $65 until March 1st and will be available to riders at packet pickup at the ride. After this date, jerseys can be purchased directly from Pactimo on the Pactimo Spring Century Store HERE until April 12th! All jerseys ordered through the store will be mailed to the rider. There is a $9 fee through the store to cover shipping and handling. There is no guarantee that you will receive the jersey ordered through the Pactimo store by ride day. Friday, April 12 - Packet pickup will be between 1 and 7 pm on Friday, April 12th at Tradesman Brewing Company - 1647 King St. Extension, Charleston, SC, 29405. Saturday, April 13 - On site packet pickup will open at 6:30 am the day of the ride. REST STOPS - We will have 3 fully stocked rest stops filled with lots of great treats: Bananas, oranges, granola bars, trail mix, chocolate snacks, salty snacks, sports hydration drinks, and other goodies. Don't worry - some routes will hit the same rest stop more than once! - SAG vehicles will be on the course to provide in route support for mechanical issues and rescue fatigued riders. We will also have onsite mechanics for last minute adjustments, but they are not miracle workers or doing tune-ups on bikes. They will have a small supply of tubes, tires, and other items for sale. Please be sure to bring some cash or credit card for these purchases. 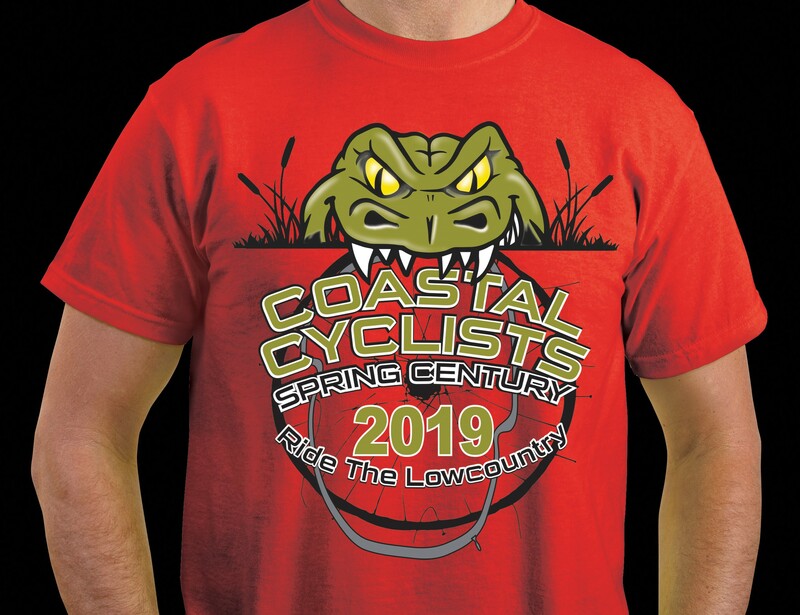 - Lowcountry Racing (LCR) will provide "ride guides"...riders who will take folks on the metric century and full century at established speeds, so you don't have to "find" a paceline that suits your speed. Look for the pace group signs at the start. 18-20MPH and 22-24MPH! - Make sure you leave time to hang out post ride and space in your stomach for the great food and music we have lined up! The awesome folks at Awendaw Green will provide a few hours of live music and the caterers will be there for your post-ride refuel! We promise to have really good South Carolina Barbecue for the after-ride meal. Your ride fee will also get you a beer or soft drink from a great Carolina brewery. This year we are offering the opportunity to buy meals for your non-riding companions who want to join us after the ride. A meal without a beverage is $10.00. A meal with an adult beverage is $13.00. You can buy tickets for companion meals online when you register. We cannot guarantee that additional meals will be available for purchase for late and walk-up registrations. Please enter the parking lots via Highway 17 (as if you were going to the Sewee Outpost). Entrance from Sewee Road will be closed. Parking attendants will be onsite to facilitate parking. We will be filling up the front parking lots (by registration) first, followed by the lots closest to the Sewee Outpost last. Helmets, comfortable cycling shorts and jersey, your favorite nutrition (if you don't like the rest stop grub) and plenty of water and water bottles. And, of course - a safe, functioning bicycle. We suggest you bring bug spray and sunscreen too! The After the Bridge Run Ride was started many years ago as a fun event held on the same weekend as the Cooper River Bridge Run. The ride never had anything to do with the beautiful and beloved bridge across the Cooper River, but it was intended to attract multi-sport athletes who happened to be in town for the Bridge Run. In our research, we found that there were also many people who did not attend our ride because getting hotels was difficult that weekend. We also found that only a very small percentage of the riders actually participated in the bridge run. This year, the date of our ride conflicted with the date of another very popular regional ride and we felt that the impact would be negative, so we chose this year to establish a new identity for the ride. It's the same great ride run by the same great people supporting the same great causes. We hope that the changes are all positive and do not cause any inconvenience. We welcome all ages, but if you're a minor, you must have a parent or guardian signature. It's best for a parent or guardian to accompany young people on the ride. There is no transportation option other than private vehicle. There is plenty of parking, though, and there will be a designated drop-off point for those who are catching a ride with someone who will not be riding. No refunds are offered. Please keep in mind that Coastal Cyclists is a 501(c)3 charitable organization and your contribution can be tax-deductlble so if you do not make it to the ride, you should consider your payment to be a contribution to the future of cycling in South Carolina. While you do not have to bring your printed ticket, it often helps because we can just scan the bar code on the ticket to confirm your reservation. Sure! Email info@racesonline.com and they can help you with your information change. Yes. It is possible to transfer your registration on the RacesOnline site. No. Because we require a release of liability form to be signed by the rider (or the parent/guardian of a minor), we require that the person on the registration be the person who rides. If it looks like you're not going to be able to ride and someone else will ride in your place, please use the RacesOnline option to transfer your registration so that the release form is appropriately modified.